Features of Manatee County include access to the southern part of the Tampa Bay estuary, the Sunshine Skyway Bridge, and the Manatee River. Manatee County ranks 15th among Florida counties in population. The southern mouth of the Manatee River was likely the landing site of the De Soto Expedition and is the location of the U.S. National Park Service's De Soto National Memorial. Map of Manatee County as it existed in 1856, one year after it was created. Manatee County had the Gamble Plantation, a sugar plantation that was one of the South's finest. 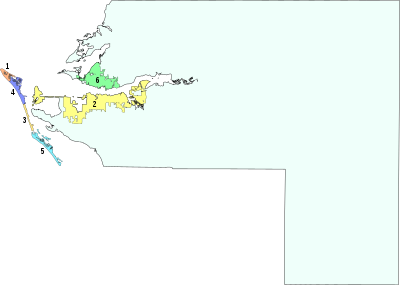 According to the U.S. Census Bureau, the county has a total area of 893 square miles (2,310 km2), of which 743 square miles (1,920 km2) is land and 150 square miles (390 km2) (%) is water. As of the census of 2000, there were 264,002 people, 112,460 households, and 73,773 families residing in the county. The population density was 356/sq mi (138/km2). There were 138,128 housing units at an average density of 186/sq mi (72/km2). The racial makeup of the county was 86.36% White, 8.19% Black or African American, 0.28% Native American, 0.90% Asian, 0.05% Pacific Islander, 2.84% from other races, and 1.39% from two or more races. 9.30% of the population were Hispanic or Latino of any race. In 2000 there were 112,460 households out of which 23.00% had children under the age of 18 living with them, 52.70% were married couples living together, 9.40% had a female householder with no husband present, and 34.40% were non-families. 28.40% of all households were made up of individuals and 15.00% had someone living alone who was 65 years of age or older. The average household size was 2.29 and the average family size was 2.78. In the county, the population was spread out with 20.70% under the age of 18, 6.50% from 18 to 24, 24.60% from 25 to 44, 23.30% from 45 to 64, and 24.90% who were 65 years of age or older. The median age was 44 years. For every 100 females, there were 93.50 males. For every 100 females age 18 and over, there were 90.50 males. The median income for a household in the county was $38,673, and the median income for a family was $46,576. Males had a median income of $31,607 versus $25,007 for females. The per capita income for the county was $22,388. About 7.10% of families and 10.10% of the population were below the poverty line, including 15.30% of those under age 18 and 6.20% of those age 65 or over. Bealls of Florida has its headquarters and was founded 1915 in unincorporated Manatee County. Tropicana was founded here in the 1950s. They were later bought by PepsiCo but continue to produce products there today. The Manatee County Public Library System offers a collection of adult, young adult, and children's materials, as well as a genealogy section and the Eaton Florida History Reading Room. Public computers for all to use are available at all library locations. The library's online resources include licensing to OverDrive, Inc., Hoopla (digital media service), and Freegal Music. The library also hosts an online digital collection featuring historic images and documents from Manatee County during the late nineteenth century to early 1980's. Additionally, Ask a Librarian, the on-line Florida librarian reference service is available through the Manatee County Public Library System. The library system also offers E-Books, E-Audio, music, and movies through five databases located on their website . The libraries also offer extensive programming that includes author luncheons, children's story-times, summer reading programs, job fairs, and book discussion groups. Special events held annually include Mana-con, a comic book convention, and the Teen Recycled Fashion Show. Manatee County participates in the Little Free Library program. The Palmetto Branch will place their Little Free Library in 2015, and then all six Manatee County Libraries will have them. Several Manatee County Parks have Little Free Libraries including Emerson Point Preserve, Robinson Preserve, Greenbrook Park, Bennett Park, Jigg's Landing and Conservatory Park. Library cards are free to those who reside, own property, attend school, and/or work in Manatee County. Non-residents may obtain a temporary card upon payment of a $20.00 annual fee. Palmetto's Carnegie Library, built in 1914. Bradenton's Carnegie Library, built in 1918. 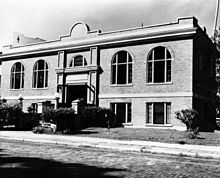 Public libraries in Manatee County began in the year 1898 with a privately owned rental library created by Mrs. Julia Fuller in the Mrs. Bass Dry Goods store. 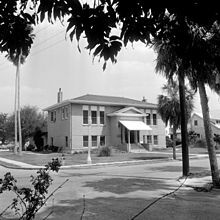 The first independent library building in the county was opened in Bradenton in 1907, followed by Palmetto building a Carnegie Library in 1914 and Bradenton doing the same in 1918. For much of the 20th century, libraries in both cities were free to city residents while county residents had to pay a non-resident fee. In 1964, the city library associations in Bradenton and Palmetto merged with the Manatee County government to create what is now known as the Manatee County Public Library System. This was followed by the establishment of a bookmobile for rural areas in late 1964 and a Talking Books program for the blind in 1966. As demands on the bookmobile grew and the library collection outstripped the existing buildings in Bradenton and Palmetto, the first branch of the Manatee County Public Library system was built in Bayshore in 1967, followed by a new branch on East Ninth Street in 1969 and an Island branch in 1971, the last of which later moved into a new building in 1983. A new building for the Palmetto Library was built in 1969, eventually followed by the modern Central Public Library in downtown Bradenton in 1978. 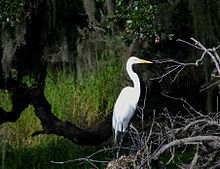 The 1990s saw a period of rapid growth for Manatee County, and the library system grew to accommodate, with the Braden River, Rocky Bluff, and South Manatee branches opening in 1991, 1994, and 1998, respectively, and the Braden River branch subsequently moved to a new building in 1997, bringing the Manatee County Library System to its modern state. in recognition of Kevin Beach, for a long-standing, distinguished record of professional achievements and accomplishments. Manatee County has a county transportation service, MCAT. It serves this county, Pinellas County, and Sarasota County. Manatee County is part of the strongly Republican Sun Belt region of Florida's southwest coast, extending south as far as Collier County. The area became a Republican stronghold following World War II and has remained so since: the last Democrat to win Manatee County was Franklin D. Roosevelt in 1944. Unincorporated Manatee County is served by the Manatee County Sheriff's Office. Manatee County is a part of the Twelfth Circuit Court of Florida. Manatee County is part of the Second District of Appeals. ^ a b At-large, representing the entire county. ^ On July 21, 2017, Governor Rick Scott appointed Hopes to fill the then-vacant seat on the Manatee board following resignation of Karen Carpenter's seat effective June 1, 2017. ^ On September 4, 2015, Governor Rick Scott appointed Colón to fill the then-vacant seat on the Manatee board following the death of Mary S. Cantrell. Information as of January 12, 2019. ^ "World Population Review | Manatee County, Florida Population 2019". worldpopulationreview.com. Retrieved March 25, 2019. ^ "Manatee History Matters: Braidentown, Bradentown, Bradenton - What's in a name?". bradenton. Retrieved April 5, 2017. ^ "Pioneer Life in Manatee County". www.mymanatee.org. Retrieved January 25, 2016. ^ "Population and Housing Unit Estimates". Retrieved April 20, 2018. ^ "U.S. Census Bureau QuickFacts". U.S. Census Bureau. Retrieved April 20, 2018. ^ "Contact Us Archived December 24, 2009, at the Wayback Machine." Bealls (Florida). Retrieved on December 14, 2009. ^ "Samoset CDP, Florida[permanent dead link]." U.S. Census Bureau. Retrieved on December 14, 2009. ^ Palmetto Friends of the Library. (Spring 2015). Palmetto Friends of the Library Newsletter. ^ Aronson, Claire. "Manatee County creates model for local Little Free Library program". bradenton.com. Retrieved March 15, 2015. ^ "2016 Library of the Year". FLA. Archived from the original on August 3, 2016. Retrieved June 22, 2016. Link found in "Awards History" for current winners. ^ "2016 Betty Davis Miller Youth Services Award". FLA. Archived from the original on August 3, 2016. Retrieved June 22, 2016. ^ "2016 Lifetime Achievement Award". FLA. Archived from the original on August 3, 2016. Retrieved June 22, 2016. ^ "2016 Outstanding Friends Member". FLA. Archived from the original on August 3, 2016. Retrieved June 22, 2016. ^ "2015 Keep Manatee Beautiful Recycling Award". FLA. Retrieved June 22, 2016. Listed under 2015 Awards Celebration Winners. ^ "2014 Libraries Change People's Lives Award". FLA. Archived from the original on August 3, 2016. Retrieved June 22, 2016. Link to 2014 award winners. ^ "2013 Library Innovation Award". FLA. Archived from the original on August 3, 2016. Retrieved June 22, 2016. Link to 2013 award winners. ^ "2013 Betty Davis Miller Youth Services Award". FLA. Archived from the original on August 3, 2016. Retrieved June 22, 2016. ^ "MCAT". www.ridemcat.org. Retrieved April 1, 2017. ^ Sullivan, Robert David (June 29, 2016). "How the red and blue map evolved over the past century". America: The Jesuit Review of Faith & Culture. Retrieved July 26, 2018. ^ "Manatee County Sheriff's office". Manatee County Sheriff. Retrieved April 2, 2017. ^ David Leip. "Dave Leip's Atlas of U.S. Presidential Elections". Uselectionatlas.org. Retrieved April 23, 2018. ^ "Board of County Commissioners". Manatee County Government. Archived from the original on May 9, 2017. Retrieved April 11, 2017. ^ "School Board Members". School District of Manatee County. Retrieved July 26, 2018. ^ Anderson, Zac (July 21, 2017). "Governor appoints Scott Hopes to Manatee School Board seat". Sarasota Herald-Tribune. Retrieved July 26, 2018. ^ Delaney, Meghin (September 4, 2015). "Gov Rick Scott appoints John Colon to Manatee School Board". Bradenton Herald. Retrieved April 11, 2017. ^ "Manatee County Supervisor of Elections > Home". VoteManatee.com. Retrieved April 11, 2017. ^ Collector, Manatee County Tax. "Manatee County Tax - Welcome". TaxCollector.com. Retrieved April 11, 2017. ^ "Manatee County Supervisor of Elections > Home". Manatee County Supervisor of Elections. Retrieved January 12, 2019. Wikimedia Commons has media related to Manatee County, Florida. Wikisource has the text of an 1879 American Cyclopædia article about Manatee County, Florida.